Slots, or one-armed bandits, are wrongfully considered as rather simple and even primitive gambling game as compared with poker, baccarat or black jack casino game. Although, if you take a closer look at types of slots diversity and slots rules variety, you would change your opinion for sure. An obvious fact that disregards completely this common delusion is that nowadays all casinos, both brick-and-mortar and online ones, are loaded with a huge amount of slot machines that are located really everywhere: at the entrance, near bar counters and, of course, in playing halls. 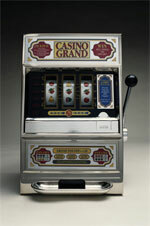 First slot machine was developed by its famous founding father Charles Fey about 120 years ago in America. It was called Liberty Bell and weighted over 100 pounds providing no fixed payoffs but granting lucky players with free beer or cigars. It may sound strange, but at the very beginning slot apparatus were designed without fruit symbols, which are nowadays so strongly associated with slots. First slot apparatus had a star, horseshoes, diamonds, spades and hearts on their three reels. At first sight there is nothing difficult to play on slot machines: players just need to put the money inside slot apparatus, pull the lever or push the start button, which launches reels spinning, and wait until a certain symbols combination appears on reels. Actually, physical actions of playing process are really limited with these simple moves, but there are a lot of important points that successful slots player should constantly keep in mind in order to make a correct bet and win the cherished jackpot. To play slots profitably players need to start with learning carefully slots pay table, which contains all the data about slots rules, the house odds, winning combinations and other useful information that is needful for playing. The sense is that all these gaming conditions could vary significantly among different types of slots. For instance, classic slots are equipped with 3 reels usually and provide lower jackpots and lower credits' costs correspondingly while progressive slots offer jackpot rewards of very high value, which could reaches sometimes more than million dollars. Therefore, if you a risk-lover and possess sufficiently large bankroll, then the best option for you is to play progressive slots. Furthermore, be careful about the quantity of paylines in slot machines, which are certain rows on reels and serve for winning symbols combinations location. In 3 reel slots payline is usually considered as the middle row while in 5 reel slot apparatus there could be more than 1 payline, which increases players' chances of winning essentially.